After finishing medical school in Edinburgh, Gavin Francis did not want to be another run-of-the-mill physician. A life spent in slavish dedication to careerism was not for him. The young medical graduate saw Antarctica as the place where he would work for the rest of his professional life. He enlisted himself as a doctor at the Halley Research Station, a British Antarctic Survey base formerly known as Ice Station Zebra. Apart from a little light dentistry and setting a few broken bones, Francis’ skills as a physician are never really tested during his time at Halley. His colleagues are very fit and there are no life-threatening illnesses, no heroic tales of life-saving surgery performed at the bottom of the planet. But the peace Francis was searching proved elusive to begin with. Though he had to rarely play doctor to his 13 base colleagues, Francis had to help out with base chores: collecting and packaging waste, cutting tunnels for plumbing and wiring, and shovelling snow to be melted for drinking water. Writing was a way out of drudgery. 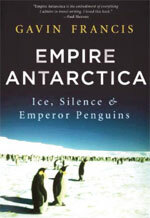 The result: Empire Antarctica: Ice, Silence & Emperor Penguins. A collection of huts and scientific arrays perched on stilts above the floating Brunt Ice Shelf, Halley is accessible by air and sea only in the short polar summer. For nearly 10 months of the year, it’s a terribly isolated planet. The tribulations faced by researchers in Antarctica in this period are the subject of Francis’ story. As he points out, today’s Antarctic winterers are cocooned in the best technology and clothing that mankind can devise. 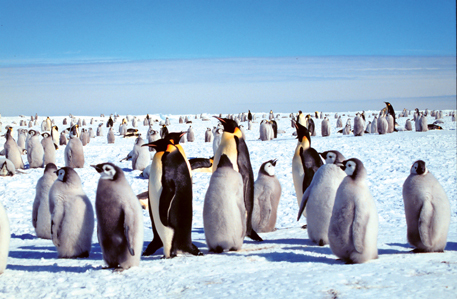 They benefit from a century of experience of South Pole survival, and are in constant contact with the outside world by radio and the Internet. But the real challenge facing the 14 men and women of Halley’s winter crew is to cope with each other and with themselves. Cliques, petty bickerings and mutinies are not uncommon on polar bases. Some people lose their minds. In search of peace, Francis realises he must escape the camp’s mundane life. He writes, “Having no way of getting in or out, and only 14 healthy base-mates to look after, I had to cast about for other things to do.” He finds routine and tranquility in skiing the same route every day, drawing comfort and calm from the fresh air and the “binary world of ice and sky”. His mind, deprived of distractions, begins to settle. “Antarctica is composed of the simplest of elements—air, ice and light—but despite that apparent simplicity there seemed no end to the varieties of beauty in the landscape,” he writes.